Who's The Latest Person To Say Dumb Things About Gay Players In The NFL? Why it's former journeyman quarterback Jim Miller! Everyone, you remember Jim, right? 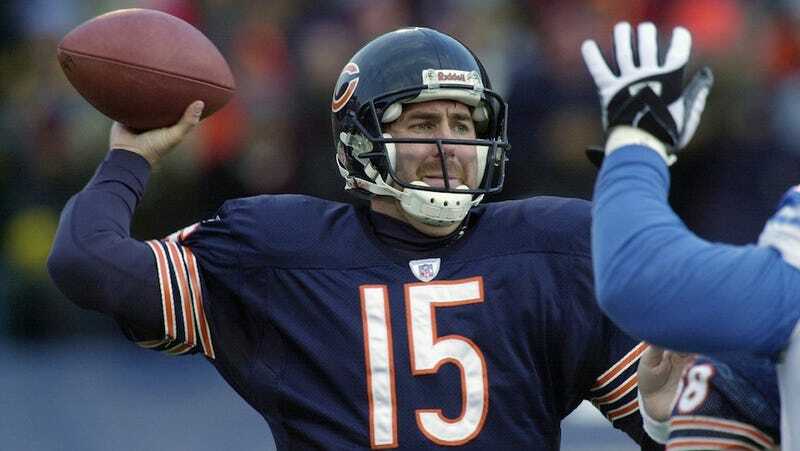 Jim is best known for his stint in Chicago, including leading the Bears to the 2001 playoffs, but now works as a postgame analyst on CSN Chicago and lives a good, conservative, god-fearing life. Miller was on the radio yesterday to talk about the plight of gays breaking into the NFL, spurred by reports from the combine that GMs were flat-out asking Manti T'eo if he's gay. Miller doesn't like gays; but he's at least smart enough not to couch it that way. "There are some religions that are just not going to accept a gay individual in the locker room," Miller told "The McNeil and Spiegel Show" on WSCR-AM 670. "So now, are you as an organization going to bring that element into your locker room and think everything is going to be OK? "Last time I checked, whether it's Christianity or Muslims or other religions that are out there, they're just not going to accept it. They're just not. It's just not realistic for Mike Florio or any progressive or liberal to think that everything is going to be OK in the locker room and we should all just wise up and accept it." Asked his stance on whether gays should be accepted, Miller said, "I could care less. You can play football or you can't. I'm just giving you my point of view that certain factions of a locker room will not accept it. ... That's the reality of the situation." This is third-hand dogmatism. Miller won't say he wouldn't accept a gay teammate. He won't even say other guys won't accept a gay teammate. But instead it's those other guys' religions (be it "Christianity or Muslims") that's the only thing standing in the way of an openly gay NFL player being feted—as if this isn't a discrimination gay non-athletes face every day. It also takes as a given that players will or should have any say in the demographics of their locker room. Miller's the latest to weigh in, stupidly, on Te'o's sexuality. Some GMs called it a "dilemma." Jason Whitlock writes that Roger Goodell should "free the gays." Miller accuses liberals of trying to force gayness on pro football. It's going to be a thousand times worse when there's an actual out gay athlete, and not just Manti Te'o's questionable judgment. But this might be a good thing, this dress rehearsal. We run the gay drill now, as practice for everyone to stake out their positions and vomit half-formed opinions, and let those who'd panic get their panicking done with early. And then, when a gay player does enter the NFL, hopefully we'll be too tired of talking about it to care.